To control flow without contaminating media such as blood, pharmaceuticals or reagents, a wide variety of medical devices and analytical equipment utilize media isolation valves. This article explores the characteristics of three main types of valves commonly used to isolate media. By comparing the advantages and disadvantages of each, this article will provide useful information for determining which valve type will best meet the needs of a specific application. To control flow without contaminating media such as blood, pharmaceuticals or reagents, a wide variety of medical devices and analytical equipment utilize media isolation valves. Isolation valves are devices that isolate a valve’s actuation mechanism from the media being moved. They can be configured as simple 2-way devices or as multi-port selector/diverters, and are typically used in applications where a simple on/off function is required without the need to gradually modulate flow. These types of valves are well suited for many types of medical applications, including those that require precise, repeatable dispensing of media in analytical, diagnostic or therapeutic equipment. What types of media isolation valves are available, and which is best suited for your requirements? There are two main types of “on/off” media isolation valves—rocker and diaphragm. Although not formally considered isolation valves, pinch valves meet the definition of a media isolated function. 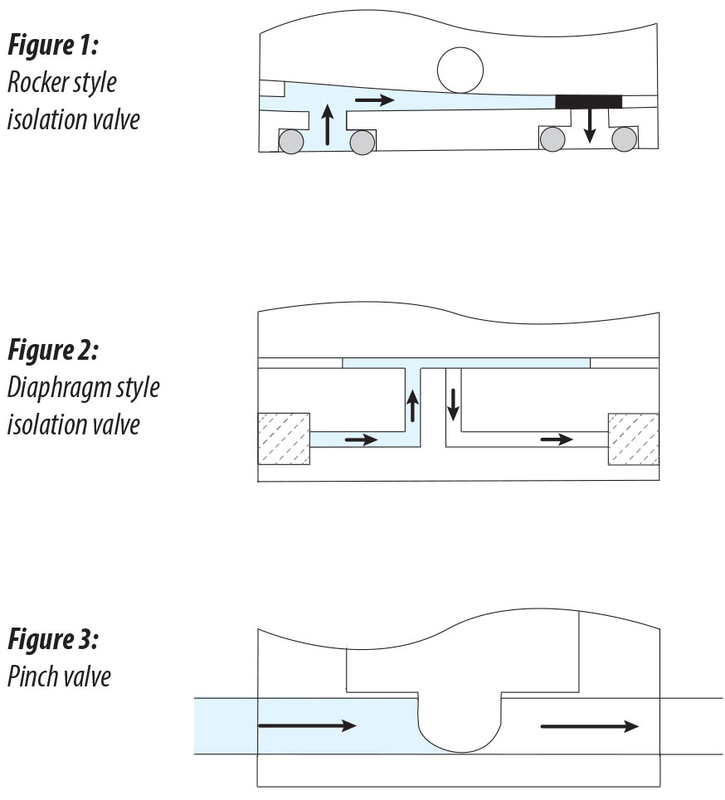 There are many variables to consider when selecting an isolation valve. We will explore each of these valve types in more detail, comparing some of the advantages and disadvantages of each. This information will be helpful in determining which isolation valve type will best meet the needs of a specific application. First, it is helpful to understand a few key concepts that describe some of the important characteristics of media isolation valves. Dead Volume—The volume inside the valve that cannot be flushed during normal operation. Minimizing or eliminating dead volume is essential in applications where cross contamination is an issue, such as drawing diagnostic samples from multiple patients. Internal Volume—The volume trapped inside the valve assembly when the valve is closed. Swept Volume—The volume of the flow path within the valve assembly. A streamlined flow path where swept volume is equal to internal volume means zero dead volume. Wetted Materials—Any material that comes in contact with the media flowing through the valve. A rocker isolation valve is a solenoid-operated device that uses a rocker mechanism that pivots to seal the valve seat and isolate the flow path. As shown in Figure 1, rocker style isolation valves can be configured as simple 2-way devices or as multi-port selector/diverters. Rocker isolation valves are generally smaller and more compact than diaphragm isolation valves, making them well suited for certain applications with specific space limitations. Some of the other benefits of rocker style isolation valves are that they can be relatively inexpensive, with low internal volume and fast actuation times. However, despite their low internal volume, rocker valves have more dead volume and are less well swept than diaphragm isolation valves. This causes them to have more carryover, which can be problematic for certain applications, as can an increased risk of cross contamination. Another factor to consider is that rocker valve designs include elastomeric seals, giving them a shorter lifespan and making them less chemically compatible than some diaphragm style valves. This type of isolation valve is most frequently used in industry for dispensing materials or to drive other larger valves. A diaphragm isolation valve—also known as a "membrane valve"—is a solenoid-operated device that uses a diaphragm that extends and retracts to seal the valve seat and isolate the flow path. Like rocker style valves, diaphragm isolation valves can also be configured as simple on/off 2-way or 3-way devices. Compared to the rocker style, diaphragm style media isolation valves feature much longer life, are better swept and have much less dead volume—some as little as zero. Another benefit of this type of isolation valve is that the diaphragm design can be made from non-elastomer materials such as PTFE, which eliminates the need for seals, providing increased chemical compatibility. This type of isolation valve can be constructed from inert materials, including an entirely inert fluid path. This makes diaphragm style isolation valves ideal for applications involving corrosive media. When selecting this type of isolation valve, it is important to consider the diaphragm material and the media that will be used. Some diaphragm style isolation valves use an elastomeric membrane such as FKM or EPDM. The high flexibility of these types of materials allows them to tolerate small amounts of fine particles, but common chemicals such as methyl alcohol or ammonia can damage these types of diaphragm membranes. For chemotherapy treatments or other applications that involve corrosive media, specially designed non-elastomeric diaphragm isolation valves are available with more robust membrane materials, such as PTFE. When choosing a valve for use with corrosive media, it is important to identify that all wetted materials are inert. For the longest lifespan and lowest risk of cross contamination, the flow path and all wetted areas of the valve should be constructed of an inert material that is compatible with the media that will be used. A pinch valve is a device that opens and closes the flow path by pinching a removable, disposable tube. Although not formally considered isolation valves, pinch valves perform an identical function by isolating the valve mechanism from the media through the use of this disposable tubing. Similar to isolation valves, pinch valves can be configured with single tubes as simple on/off 2-way devices or with multiple tubes as multi-port selector/diverters. Pinch valves may be operated by electricity, air pressure, or manual operation. The operation power of electrically-actuated pinch valves varies greatly according to the application and size of the valve. Most draw anywhere from 0.5 to 10 watts AC or DC at a range of voltages—typically 12 or 24 VDC—and can usually run off a medical system's internal power supply. Pneumatically actuated pinch valves are the preferred choice in explosive/hazardous environments where a shorted or overheated solenoid could become an ignition source. They are also able to deliver more force, making them a good option for applications that require the use of firmer (higher durometer) tubing. Another advantage is size—since pneumatically piloted units are able to provide more force, the size can be scaled down to fit into smaller, more compact spaces. For medical applications, pinch valves typically use medical-grade silicone tubing. If chemical compatibility is an issue other materials may be used, provided they match the pinch mechanism's original durometer and O.D./I.D. specifications. For example, media containing chloroform, ether, and some common alcohols will dissolve silicone tubing, however Neoprene tubing can be safely substituted. By using the tubing as a gating element, pinch valves provide effective media isolation with zero internal or dead volume, without the need for a complex mechanism. This also allows pinch valves to tolerate significant levels of suspended particulates in the media they carry. The biggest benefit that pinch valves offer over isolation valves is that the tubing used in the pinch mechanism is easily replaceable in case of failure or need for stringent cross-contamination control. Pinch valves also have a few drawbacks. For example, they may require more electrical power or air pressure to actuate than a diaphragm-style valve. They also tend to create an oval profile in the pinch tubing after repeated use, a phenomenon that can reduce the flow of viscous fluids and make the valve prone to clogs. For applications with media that contains larger particulates, Platinum-cured tubing is an excellent option as it is significantly less prone to this issue. Another factor to consider is that pinch tubes are quite soft (45-55 durometer) and cannot handle high-pressure media. As a result, the maximum allowable pressure is typically in the range of 20 to 30 psi for soft tubing. Despite these issues, the sterility offered by disposable tubing makes pinch valves an excellent choice for many medical applications such as intravenous systems, drug delivery, and dialysis instrumentation. They are also frequently used in patient care applications such as sampling, dosing, and infusion. Medical equipment is expected to operate reliably for long periods of time, so the operational lifetime of its components becomes an important design consideration. Like any other mechanism, a valve has a finite lifetime, but cycle life varies significantly between valve types. For example, media isolation valves with elastomeric diaphragms are often rated for hundreds of millions of cycles, while those with non-elastomeric diaphragms typically carry lifetime ratings in the 10's of millions of cycles. This is because the non-elastomeric materials (i.e. PTFE) are relatively soft and subject to accelerated wear. Pinch valves also suffer from wear and tear, but most of that occurs in the pinch tube itself, which is designed to be disposable. This means that the operational life of a pinch valve is primarily limited by the lifetime of its pneumatic actuator or electrical solenoid—often rated in the hundreds of millions or even billions of cycles. The lifetime of the pinch tube itself varies widely according to the material it is made of. Neoprene tubing, for example, will start to deteriorate in several hundred thousand cycles while most silicone-based tubing can survive for several million cycles. Choosing the best valve for your application involves finding the best match between a design's requirements and the valve's characteristics. This is not always a straightforward process since so many variables are involved. For example, how much flow is needed, and what is the pressure of the media? Are there certain space limitations, specific power requirements or a minimum required response time or lifespan? What type of media is being used, and what materials of construction is it compatible with? Does it contain particulates? How much of a concern is cross contamination? Would disposable tubing be beneficial? The following table highlights some of the different characteristics of these types of valves and may be used as a guide for selecting the right type of valve to best meet the needs of a specific application.